It worked like a charm last night starting the charging at 12:30 am. I did get three charge starting emails though, at 12:30 am, 12:31 am, and 12:50 am. Looking at my power consumption the car started charging at 12:30 am and continued without interruption. One suggestion for future capability would be to have a pre-climate schedule like the charge schedule (similar to the car's internal capability) but have the option to only run pre-climate if the car is plugged in. I extended charged last night. This morning, I logged into ravcharge.com for the first time and it reported I have approx 35kwh. Is is correct? I thought Tony's above post said you can differentiate between 100% "Normal" and "Extended" charge. (I've also press the "update now" button several times with the same 35.0kwh status). Also, can the climate control override the 50% battery limitation? The two emails at 12:30 and 12:31 seem to always happen when sending a charge start command through entune. The later one at 12:50 is because I've set RavCharge to automatically send a "backup" charge command 20 minutes after the nominal command, just in case. This is probably overly cautious, since the first one will try about 4 times until the charge start is confirmed, but it doesn't seem to hurt anything except for the extra email. Interesting idea, I'll check it out. There seems to be a lot of interesting things that can be done with the pre climate. Everything's built around normal mode for now. The app can tell if you're in extended or normal charge mode, but I think the SOC reading is always based on normal charge mode (like the bars in the car.) So 100% SOC in extended charge could really mean anything from 35-41.8kwh. I haven't really tested this to make sure though - if you get a chance do a status update after you drive a bit but before you lose any of the visible battery bars in the dash and we'll see what happens. I actually didn't even know about this limitation, as I've never run into it. My guess would be RavCharge won't be able to do it if the entune app can't, but you're certainly welcome to try and report back! This may be a "dumb" question, but if you close (kill) your browser, while RAVCharge is waiting to commence a charge set by Timer1 left in the "On" mode, will this prevent it from working? I'm not really sure what Timer2 is for, or how to use it. It seems redundant if you're already using Timer #1. Is #2 for scheduling a charge at a different time of day/night, say on different days of the week from #1? For example, can I set up Timer #1 for Saturday and Sundays starting charges at 21:00 (9pm), and TImer #2 for the rest of the week starting at 24:00 (midnight), where both pre-set scheduled charges always start during off peak rate periods? Suggestion: Most of us probably have determined a running average miles/kWh that is suitable for our cars most of the time. To avoid confusion, RAVCharge should allow user input of this value instead of giving a selection of values at 2/3/4 miles/kWh. Inputting an average value characteristic of the user's car, which could be a 3 significant digits decimal number like "3.5", would then result in a more precise range estimate for the battery's current SoC. This may be a "dumb" question, but if you close (kill) your browser, while RAVCharge is waiting to commence a charge set by the Timer #1 left in the "On" mode, will this prevent it from working? No. Once you set a timer, and see that the time you selected is reflected on your screen, it's saved on a separate, always-running server that's independent of the server that handles the web page you see. The same goes for the command buttons to update, charge, or start/stop climate control. Once you push the button, the command is sent to the server, where it will keep trying for about 8 minutes or until it works. You can wait around for the confirmation pop-up if you wish, but there's no need to. One idea for a future improvement in this area is to send email or SMS notifications to the user to confirm that a command worked or let you know if it failed so you can come back to RavCharge and try again. I'm not really sure what Timer #2 is for, or how to use it. It seems redundant if you're already using Timer #1. Is #2 for scheduling a charge at a different time of day/night, say on different days of the week from #1? For example, can I set up Timer #1 for Saturday and Sundays starting charges at 21:00 (9pm), and TImer #2 for the rest of the week starting at 2400 (midnight), where both set scheduled charges to always start during off peak rate periods? Yeah, that's the idea. Some people might want to charge at different times on the weekends, or charge twice per day, or use timer 2 for setting a temporary timer without having to change the usual timer, or whatever else anyone thinks of. Good suggestion, and I have thought of doing this, but what you're describing is basically what the Guess-o-Meter already does, and I was trying to come up with something different. That said, the whole 2/3/4 thing was just a quick idea, and I certainly do plan on improving that display one way or another. but what you're describing is basically what the Guess-o-Meter already does, and I was trying to come up with something different. That said, the whole 2/3/4 thing was just a quick idea, and I certainly do plan on improving that display one way or another. The GOM is guessing based on some unknown formula based on past performance. Selecting 3.5 miles/kWh, for example, is my user selectable prediction of the future driving. I tried out a new status page that lets you vary the miles/kwh and calculate the estimated range in real time. It'll reset to a default of 3 m/kwh each time you refresh for now, but I'll work on making the value you choose persistent. Last night I used Timer1 to do a scheduled (normal) charge. I set it to start at 9pm, and am very pleased to report that it WORKED exactly as advertised. The first attempt (according to Entunes Email Notification) failed at that actual time setting, then successful on the 2nd attempt (at 9:02pm). RavCharge sent another charge "start" command at 9:20pm for good measure. The charge completed about 2 1/2 hours later (11:27pm), resulting in "100%" charge status on RavCharge and 105 miles ESTIMATED range (at default RavCharge setting of 3.0 mi/kWh). At the end of last week, the last running average displayed on the center console inside my car was "3.5mi/kWh", atypical of my wife's usual driving style. I reset the display just before I drove the car ~40 more miles on Saturday, so the average eventually dropped to "3.3mi/kWh" by the end of the day. If my wife had been driving all day, no doubt the reading would have continued dropping even lower. All of which brings me to say, I didn't change the default average for range estimation in RavCharge, because I don't really know which is more accurate, the GoM in the car or RavCharge. 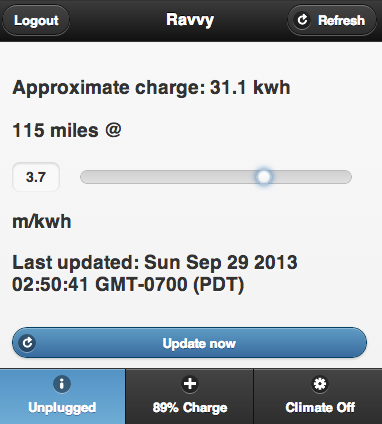 After charge completion last night, RavCharge displayed "105 miles" (still at the default of 3 mi/kWh). However, the actual range displayed on the GoM in the car (with A/C off) was "95 miles" for a mismatch of about 10 miles, or 0.3mi/kWh. A lot of this is still essentially "guesswork". A range of 95 miles corresponds to a usable battery SoC of only ~32kWh, (not 35kWh as generally assumed after being fully charged in normal mode). However, calculating what 80% of a fully charged battery actually would be, results in 33.4kWh of usable capacity. Which of these charge capacities is more accurate, Toyota's published 35kWh or 33.4kWh (80% of 41.8kWh)? To be more conservative, the obvious answer is the latter, which in my case just so happens to correlate closer to my actual GoM range. Then there is battery capacity degradation over time as an influencing factor to be considered. I have only owner my car for the last 10 months. It has only been driven about 5000 miles, so I do not consider any cummulative battery degradation as yet very significant. However, RavCharge should probably still allow for degradation with some sort of time based multiplier to determine what corresponds to a 100% (normal) charge status. For example, -3% per year, or -0.1% per 500 miles, could be applied. For the time being, my GoM's normalized reading based on a running average for my household's driving style of 3.0mi/kWh is probably a pretty good "number". The estimate can be skewed a little one way or the other if the estimation of range is more for one specific person's driving style or special circumstances. The bottom line, I'd rather not rely on an overestimated range, so the RavCharge default of "3" is right for me, but just to be super conservative, 2.7 would be better to use as RavCharge's running average for my wife. In any case, I feel RavCharge is a complete SUCCESS!!! I logged into RAVCharge.com and received the below dump in my browser. I have two RAV4s and the Entune apps don't even work well with the two cars. I hope yours will deal with this. Thanks for pointing this out. I haven't made any provision for someone with more than one car under the same entune account - although I thought it would just pick one, not crash . But now I have someone to do some testing and figure it out! Send me a PM with your entune email and I'll figure it out. Thanks! EDIT: I figured out which email belongs to you, and I set it up so one of your cars works. The other one doesn't seem to work with entune, so I can't do anything about it. Maybe you still need to set it up with entune? Entune gives me the same error that I've seen with other users who tried RavCharge but hadn't completely set up entune yet. Last edited by fooljoe on Sun Sep 29, 2013 10:49 pm, edited 2 times in total.